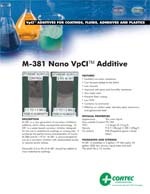 Description: M-381 is a water-based corrosion inhibitor additive designed for waterborne coatings or compounds.381 should be used with carboxylated acrylic or styrene-acrylic latices. No ammonia is present in this additive. Package: 5 gallon (19 liter) plastic pails, 55 gallon (208 liter) drums, liquid totes and bulk.